Climate Controlled Vinotheque wine cabinet solutions are NO LONGER available. January 2015 - After 30 years, Vinotheque has stopped producing wine cabinets, any needed parts/service will still be available from the affiliate company WhisperKool who continues to be strong in sales of wine cellar cooling units. Please see our other selection of other wine cabinets available. Wine CellR wine cabinets are practical, cost effective cabinets that are great for catering professionals or the new wine connoisseur. Metal and Stainless Steel. Extreme climate conditions? Many of the EuroCave wine fridge cabinets are able to withstand temperatures from 0 to 35° Celsius. 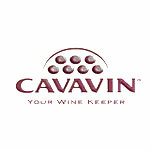 Cavavin offers wine rack cabinets in Wild Cherry, Oak, Pine, Stainless Steel and more in a variety of sizes. ALL Majestika units can be Built-In or Stand alone, Dual Temperature, Credenza's and a variety of smaller units. Solid Wood or Stainless Steel exterior range from 80 Bottles and up. Smaller units start at 12 bottles and up. Check out the affordable Urbania Series - 149/160 bottle capacity. 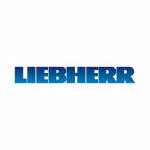 Built-in or Free-Standing AND dual temperature zones available. 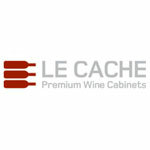 Le Cache makes premier wine cabinets built from cherry wood. There are several wine storage cabinets to choose from. Storage from 172 to 622 bottles. Within each model there are usually three color choices. Credenzas & Upright models are available. If you need to put the unit in your garage or warmer location, check out the LC3100 Storage. 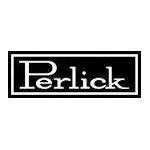 Check out our Shipping Credit!! Le Cache also has a BILD series of melamine faced, unassembled cabinets that are an economical choice for a value conscious wine collector. Vintage Keeper is the world's most economical wine cooler cabinet. Bottle storage from 110 to 500 bottles. There are four models and two different colors of this wine cooler to choose from. Available in your choice of Black or Mahogany. New Series called the Wine KoolR. The pinnacle of Danby's wine cooler selection is the Silhouette line. 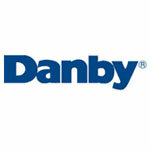 Danby's Silhouette wine coolers are Built-In cabinets meaning front venting with zero clearance required. Glass doors with stainless steel trim. A number of manufacturers offer a credenza style cabinet. Click on the links below the heading of each manufacturer to lead to the credenza area of the respective manufacturer. 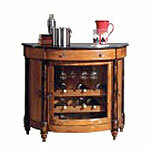 Beautifully crafted line of spirits and wine furniture. 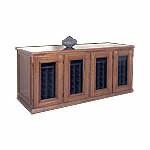 Howard Miller offers a variety of styles and sizes of wood wine cabinets. Please note these cabinets are not climate controlled. Wine bars and hide a bar cabinets are creative wine storage options for your entertaining room. These wooden wine cabinets are not climate controlled and ship directly from the manufacturer, Howard Miller. 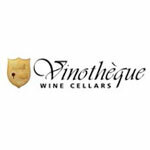 Vinotheque Cabinets - NO LONGER AVAILABLE!! Vinotheque Wine Cabinets are quality cabinets that allow for the proper aging of wines. The superior technology, developed with over 25 years experience in the manufacturing of wine cabinets. Vinotheque cabinets represent a perfect blend of refined technology and artisan workmanship. The Vinotheque team of specialty wood workers and cabinet makers hand craft each cabinet to customer specifications. As a result, the cabinets are sophisticated, self contained climate controlled wine storage solutions that serve as refined functional extensions to your furniture and decor. The Vinotheque cabinets are defined through specified door and molding styles. Some cabinets also feature distinct wood selections. Specific options include size, racking, wood finish and front venting. STAINLESS STEEL / ALUMA STEEL - Rosehill offers QT Cooling System as a standard feature - LED Light Strip for Angled Display Included - Door style: glass double doors - Progressive Plus, wood racking. Front venting also available to allow these Freestanding wine cabinets to be Built-in with zero clearance. VILLA SERIES - Venetian, Sienna, Roma - Comes standard with a WK 2500 Cooling System - 220, 330 and 440 bottle capacity upright cabinets available and credenza models - Comes standard with durable metal racking - Made of Alder wood - Optional LED Lighting - Quickest Ship Time! ESTATE SERIES - Rosehill offers QT Cooling System as a standard feature - Signature Vinotheque Custom Wood Wine cabinets - Progressive Plus, wood racking - LED Light Strip for Angled Display Included - Available in a variety of wood finishes including Alder, Red Oak, Luan Mahogany and more. WINE RESERVOIR SERIES - Economical Wood Cabinet - Comes standard with a WK 2500 Cooling System - Solid wood door - Comes in Black Stained or Unfinished - Optional LED Lighting - Optional display rows - Durable metal racking. STUDIO SERIES - Economical Wood Cabinet - Comes standard with a WK 2500 Cooling System - Tinted window door - Comes in Black Stained or Unfinished - Optional LED Lighting - Optional display rows - Durable metal racking. RESERVE SERIES - Special Interest Cabinets - Corners, Closets or Custom applications. Climate Controlled Vinotheque wine storage solutions. JUST BEAUTIFUL! Credenzas & Upright models available. Estate Vinotheque wooden wine cabinets have QT series Cooling system and PDT upgrade already included in our price. Be sure to compare apples to apples!! The QT Series of cabinets is Vinotheque's Signature Series. We offer these cabinets "fully loaded" with furniture finish, wood racking & PDT. The VILLA series of cabinets is a lower cost alternative. Same great Vinotheque name & quality. These wine storage cabinets are available in WK series only & with metal racking. The Wine Reservoir & Studio offers a lower cost solution for a Vinotheque cabinet.